A VG book in unclipped 1st issue 8/3 dust jacket ! A bargain . . .
A VG+ book in original 7/6 Hodder Archive dust jacket ! The partial Hodder jacket shows no loss etc - lovely and clean with artwork extending to rear panel - superb ! An absolutely unique and very collectable item - bargain !!! "very bright and the solution so unexpected" (Manchester Guardian). Clemence Dane, reviewing it in the Book Society's magazine, called it "that rare thing, a detective-story which one can read twice. I know it is, for I did read it twice—and each time with enjoyment." The scene is a suburban house in which Gregory Matthews, an old" reprobate disliked by everybody, is found dead from nicotine poisoning. With him live his domineering sister Harriet, whose passion for mean little economies eventually leads her to disaster; and his sister-in-law Zoe, wijose non-stop sentimental chatter infuriates her son Guy and her daughter Stella. The Matthews family circle also includes Gregory's second sister, Gertrude Lupton, who takes every opportunity of interfering with her relatives; and his nephew and heir Randall, a suave young man described as "an amiable snake," who is loathed by all, but keeps a firm grip on the family's affairs and enters on a trial of wits with Inspector Hannasyde, the Scotland Yard officer investigating the case. All these characters leap to life in amusing dialogue: the Matthews family may be unpleasant, but no reader could fail to chuckle at them. And how clever the plot is! The second death follows naturally from the first, and the identity of the murderer is concealed till the very end of the book. 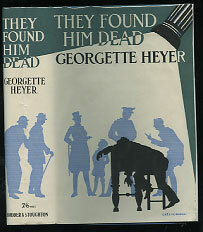 Georgette Heyer is distinguished in two branches of fiction. Besides detective-stories, she writes historical novels of great popularity, all based on careful study of the original sources. She has travelled widely, and now lives close to London's Piccadilly Circus. A big sprawling country house, a peculiar Christmas party, 8 odd-ball guests, all the settings for a most unseasonable murder - somebody presents the host with a present . . . a knife ! Superintendent Hannasyde investigates why a man seemingly loved by all has been battered to death, confusion becomes worse with a second death but there's a brilliant twist. 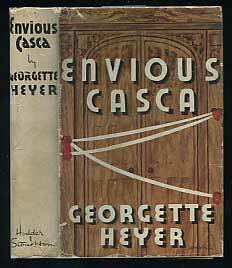 These really are quality mystery stories, a great period author. Eleven people wished him dead - but which one had partnered death on a morning stroll ? 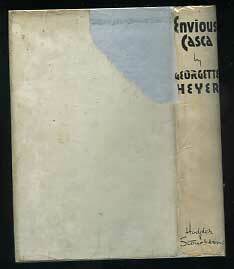 HEYER, Georgette. Also wrote as Stella Martin. British. Born 16 August 1902. Educated at seminary schools and Westminster College, London. Married George Ronald Rougier in 1925; one son. Lived in East Africa. 1925-28, and in Yugoslavia, 1928-29. Died 5 July 1974.